No secret; I have a minor aversion to some of the more popular places for weekends away, whats there to see that hasn’t been seen? Its always more exciting choosing the path less travelled. I first heard of Tandala House a couple of years back, the trick was finding enough people to actually fill the place, those who try to organize anything involving a large group of people know that its a tiresome task at best. However when the chance came along for me to sort out a family holiday together i knew just where we’d be headed. Tandala House is a self – catering property located in Bisil, Kajiado on the Namanga – Nairobi Road at the foot of the Maparasha Hills. It is set on 320 acres of private land and is available for hire on an exclusive basis for a minimum of 2 nights. Nairobi to Bisil will take you about 2hrs, a relatively short drive but i still recommend an early start if only to sympathize with all the glum faces in traffic headed into town for work as you blast off for good times. Nairobi – Bisil road is very well tarmacked. From there another 20min or so on a well maintained murram road brings you to the house. 2WD accessible when dry. The house is very well done it stands loud and proud as a clear labour of love. The history of the family who own Tandala House is everywhere, knick-knacks and photos give the feeling of a home and you could almost lie to yourself that you are simply guests of the owners for a few days. That’s the beauty of self-catering accommodation, you don’t feel like a unit in the clutches of some large corporation. Lets see if i can get this right, the house has 3 double bedrooms, 1 bedroom with two singles and a children’s bedroom with 2 single beds. The house is very child friendly. The staff (whats a better word for this?) are very good with the kids and there is so much for them to do and explore leaving the parents some chill out time. The kids bedroom adjoining one of the double bedrooms, they really have thought of even the smallest touches. One of the double bedrooms beneath the pool. That being said the house does suffer from the old adage (that i just made up) “All bathrooms are equal; but some bathrooms are more equal that others“. 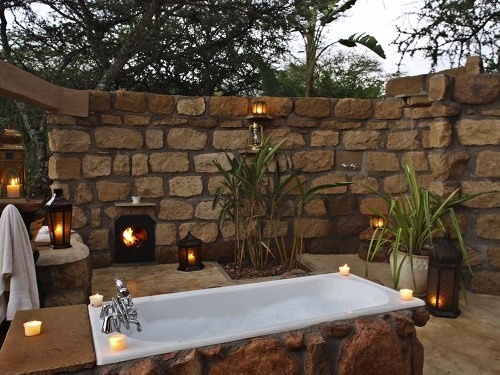 The bathrooms heated by firewood as opposed to gas are very ineffective, not much of a problem when the weathers good, but in the chillier months you might find yourself having to share a shower. Which could either be the the best or the worst idea ever depending on the make-up of your group. Not so bad when the bathrooms look like this though. The house is not connected to the electricity grid but there is a generator that runs from 6pm – 10pm in the evening. You can pay a small amount to keep it running for a while longer if you wish. The kitchen is fully equipped with gas cooker, solar fridge and freezer. All cutlery and utensils are provided. Bring along your food and drinks and even that is not necessary as they can also provide you with a catered option or assist you with a shopping list. There is a chef available so no need to stress yourself about meals. There is a barbeque and brasserie cooker situated at the pool area should you want to indulge in some alfresco cheffery (?). Charcoal is provided. There are 3 options for dining that i was too lazy to take photos of, in the main house, an outdoor area on the patio next to the kitchen and another area next to the pool.The roof top is also great for sundowners (bring enough drinks) with a great view. A heated scrabble game goes down at the pool. Nice place to while away a morning or afternoon. Almost every one in our group took advantage of this, prices were fair and from what i heard the massages were very relaxing! 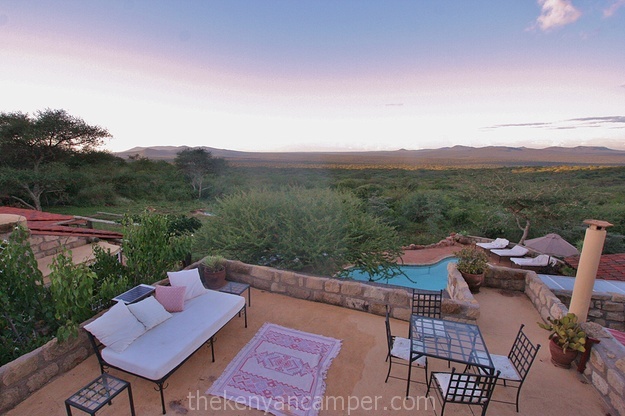 There are other activities such as picnics at some of the picnic spots on the property, walks, or you could even drive to Amboseli National Park which is about 2hrs away. I won’t write about what I didn’t experience myself but enquire when booking about what other activities they might offer. The Very Good, The Slightly Bad and the Not So Ugly. There’s no debate about it, you are really well taken care off by the people who work here. Patricia the host (why shes sold as a housekeeper ill never know) easily and efficiently makes you feel at home. This leads to one of the chinks in Tandala Houses armour, the service is a bit too in-your-face. I’m not sure to what levels of service many tourists or expats are used to but the over attentiveness did make me quite uncomfortable at times. Is it necessary to have 2 people standing next your table while you’re having dinner, jumping to attention every time you so much as glance at the salt? Hello to the 1920s. I thought most people choose the self-catering option to be more independent, i could be wrong. The reservation process was exemplary. I never did get to meet or even talk to the reservations person on the phone but it was a pleasure dealing with her. All emails received a timely and courteous reply. Thanks Jill! It’s quite amazing how other places still get simple part of hospitality wrong. We paid Ksh 28,000 per night amongst 6 adults which comes to Ksh 4700 per person. Costs will vary according to the number of people in your party. It may not be the cheapest option but compared to many hotels and lodges and considering you are hiring out the place on an exclusive basis? Well worth it. When visiting Tandala House i suggest not planning on leaving the property. The house is actually the major attraction and it is designed to encourage social interaction while being large enough for you to have your own space should you need it. There also a few surprises about the house I’ve left out to be discovered on your visit. So next time you feel the need to hit the reset button, fight the feeling to drive down the escarpment to the place-we-shall-not-mention, give Tandala House a try.For bookings contact Jill at tandalaestate@gmail.com and for more info see here and here. This blog is where i share with you, so if you enjoyed the article, please share it with someone else. Cheers! If you want to see more of my photos, follow me on Instagram or Twitter. This entry was posted in Cottage, House and tagged amboseli, cottage, house, kenya, self catering on June 11, 2014 by thekenyancamper. Great place,great commentary, the next time you feel lazy taking a picture, remember ,that is not just a camera, its the eyes of all your followers ,some of us travel through the blog. good work mate. Must people dont comment but you did, your feedback makes the blog what it is. The point on the photos is noted, call me out if it happens again! And indeed it is worth checking out. Thanks for your comment! The costs are in the article, you decide. You will like even more when you go, that is assured. Looks great! Planning on making a trip down there pretty soon. Are there low/high season rates or just standard rates? All info is contained in the article, but i guess you could contact them directly and ask. Good stuff, will await your experience. Read the blog out of curiosity as i too prefer the less beaten path..first look at the photo lounge /living room and i was wowed. It is beautiful . I must visit. Challenge will be to get a group..ugh but will go alone if i have to.The post or is it a review is well written balanced. Thank you. Thanks. what a breath of fresh air this place is. It is indeed, thanks for reading the article. We’re really hoping to go but are having a tough time contacting the owner – do you have a phone number by any chance? Thanks! Sorry, that’s all the info I have. Hi, Am a Jane-come-lately to this blog and this post in particular but am so glad I found it! Always love reading ur posts…..this place just got added to our long bucketlist. cheers.